The vegetable we were once forced to eat as children are making a strong comeback with their multitude of different health benefits and variety of ways to prepare them. 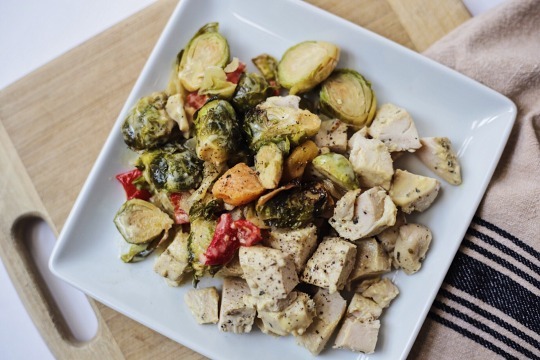 Here at Eating Primal, we incorporate brussel sprouts in many of our meals, with good reason! Brussel sprouts are a part of the cruciferous vegetable family. Cruciferous vegetables are a powerhouse group of veggies that have been shown to help combat certain cancers. This particular group of veggies contain compounds called glucosinolates and indole-3-carbinol, which has been shown to reduce the risk of breast, colon and lung cancer [*]. Along with helping fight against certain cancers, brussel sprouts are a strong source of vitamin K. Brussel sprouts contain over 270 percent of your daily value in just 1 cup! Vitamin K is a bone-building vitamin that helps to prevent conditions such as bone fractures or osteoporosis. Brussel sprouts provide the body with a large amount of vitamin C which helps to boost the immune system. Vitamin C acts as a protective antioxidant, helping to diminish inflammation and cell damage. The strong supply of vitamin C, K and other antioxidants make brussel sprouts a strong fighter of inflammation which has been shown to be the root cause of many chronic diseases. Along with fighting inflammation, glucosinolates in brussel sprouts also help in protecting the lining of the digestive tract and stomach, decreasing the chance of a leaky gut. The amount of fiber brussel sprouts provide is also an important factor in protecting your gut health with 1 cup providing up to 4 grams of fiber! Maintaining a healthy gut is important not only to protect the digestive tract, but because of its connection to the brain as well! More studies have been published showing the strong connection the brain and gut have with one another. The powerful antioxidants in brussel sprouts reduce oxidative stress and inflammation that could potentially damage brain cells. Another antioxidant found in brussel sprouts is alpha-lipoic acid (ALA). ALA is involved in many different functions in the mitochondria, including energy metabolism and the decrease of glucose in the blood. Its ability to protect against heart diseases, liver diseases, diabetes and cognitive decline makes it an important part of the health benefits of brussel sprouts [*]. The positives of brussel sprouts don’t just stop at the health benefits, there are many ways to make them too! Roasted or sauteed are a couple of our favorite ways to cook them, especially with some sprinkled bacon or fresh herbs to leave you satiated and fulfilled. The Eating Primal family encourages you to try our favorite ways to prepare brussel sprouts to please those taste buds while reaching optimal health!